While trying my new OPI On Her Majestys Secret Service from the Skyfall collection I had a moment of Deja Vu. So I went and looked through my Zoya polishes. Sure enough there was FeiFei and they looked pretty similar. 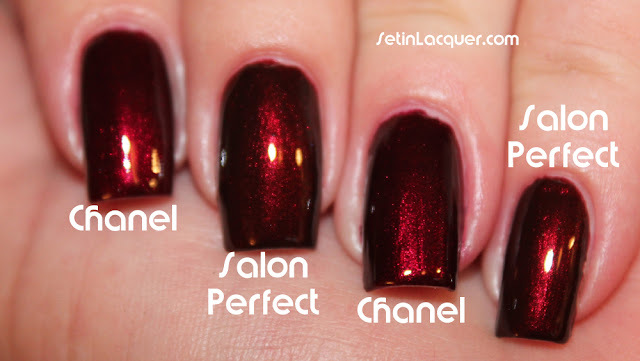 So I did comparison swatches for you. In my opinion OPI On Her Majestys Secret Service may be just a tad bit darker than Zoya FeiFei. OPI On Her Majestys Secret Service on the pointer and middle finger. Zoya Fei Fei on the ring finger and pinkie. This photo is blurred and shows the similarity in the sparkle of the glass flecks. What are your thoughts? My opinion is they are so similar you only need one of them. These two polishes looked pretty close in color - in the bottle. Applied they are similar but in no way alike. Zoya Suri and Sally Hansen Flair are both deep purples. But the Sally Hansen leans more toward the pink hues and Zoya leans more toward the blue hues.